“Running games from a USB drive, are you mad? !” Look, I’m not advocating installing Windows on a pendrive here – it just doesn’t have the 4k random read/write performance – but given the unprecedented straightline performance of Samsung’s new T5 portable drive you’re looking at external speeds faster than most SATA SSDs. Rather have it hidden in your rig? Check out our pick of the best SSDs for gaming. 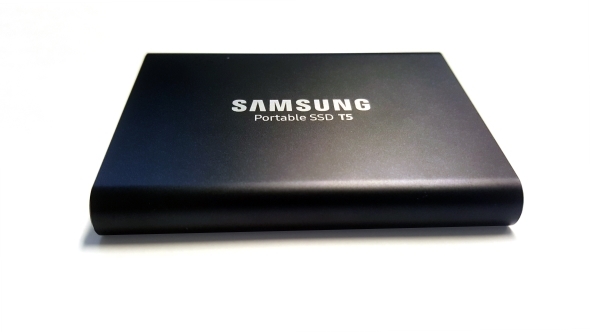 Samsung have been creating portable SSDs for years now, starting with their impressive – and impressively small – T1 back in 2015. They’re the proud owners of some of the finest internal SSDs in the world so it makes sense for them to take their 3D VNAND flash memory on the road to provide super-speedy portable storage for the masses, too. Ostensibly, this is a high-performance external drive for the serious professional users. The wedding photographers, the video people, in short, the kind of folk generating huge amounts of data on the fly which they need to transport around quickly and safely. 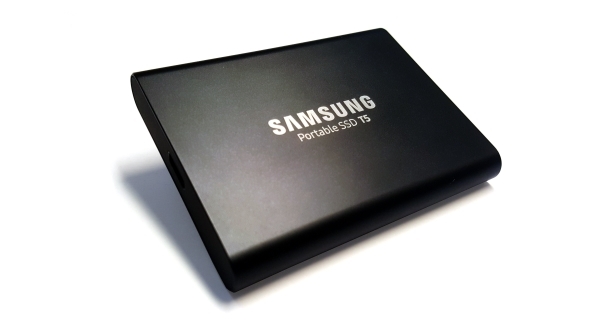 The 64-bit TLC VNAND inside the Samsung T5 means it runs mighty speedily over the USB 3.1 interface and there are no moving parts (SSD, innit) so the little device is more rugged than a muddy Land Rover with four-day-old stubble. We measured read/write speeds of 404MB/s and 389MB/s respectively in AS SSD over the standard USB interface, with that leaping up to 518MB/s and 492MB/s when we switched over to USB 3.1 Type-C. That’s faster than a lot of the SATA SSDs you’ll find clogging up the virtual Amazon aisles. That means you can transfer a vast amount of data nearly five times faster than a standard external hard drive. I gave our 2TB drive to the PCGamesN video team to try out recently at Gamescom and had to fight them to get the damned thing back. “From my cold, dead hands,” was the phrase, I think. If you’ve ever seen the John Carpenter film ‘They Live’ you’ll have an idea of the kind of bruising battle I went through to get the T5 back near our test rig. My arm’s been in a sling for a couple of weeks, I still get these headaches, and the HR department of PCGN had quitea lot to say about it.We’re friends now, but it was touch and go for a while there. The level of data necessary in video editing – and the speed with which you need to do it in a pressured professional environment – makes the T5 the perfect storage tool. But Samsung’s sleek little drive deserves more than that sort of tedious grunt work. Thanks to the level of throughput the T5 can offer, with its SATA to USB connection, it can happily be used as an extension to your PC’s high-performance storage array. I’ve been using a SATA to USB 3 adapter to run our SSD-based gaming benchmarks, for gaming desktop and laptop reviews, since even before the PCGN times, way back in the long, long ago. And the T5 blows that testing SSD out of the water in straight storage performance terms, and that’s because it’s smaller and way more robust, too. Of course, at $798(£755) the 2TB version is a little unrealistic to house your extended gaming library – a 1TB Samsung 960 EVO NVMe drive is only $448 (£405) and that is way quicker – but there are more reasonably priced 250GB and 500GB versions of the portable little Samsung T5. Obviously the main caveat is that you need to have a modern machine with Type-C USB 3.1 (supporting UASP mode) connection to get the top speed out of the drive, but modern gaming laptops will often tick those boxes. Sure, it would be a luxury purchase, and if you’re truly concerned about a paucity of pacey storage inside your notebook you’d be better off simply buying a bigger SSD to drop into it yourself, but the fact we’re getting this sort of speed out of an external USB drive is pretty stunning. Samsung are, once again, showing they’ve got the performance storage side of the market sewn up. And, with the T5, they’re just showing off now.